I know that I did not get around to commenting on all the folks that linked up to the last two parties while I was on vacation. I have to make a confession. I started seriously getting stressed out because I felt guilty not visiting everyone that left me a comment on any of my posts that I wrote while on vacation. I was trying so hard to visit everyone that I wasn’t doing the things that I needed to do in my everyday life. Finally after a very stressful day it dawned on me that everyone does not expect me to return a comment for every comment left on one of my posts, especially knowing I was on vacation. And a little voice in my head said, “Hello Diann! Most of your readers are bloggers as well. They get it!” So, if I haven’t visited you in awhile, you now know why. Okay, on with the party! I know this is going to surprise you but, yes I did hit a couple of yard sales while on vacation! Shocking huh? NOT! This was a perfect find while camping! For only .50 cents, it was cleaned and used to hold ice cold lemonade! These are just so pretty! There was only 2 of them but, I couldn’t resist their .10 cent price tag! This large glass dish/candle holder is 12” tall. I thought it will be pretty for serving salads or used as a pretty candle holder. It was .75 cents. I love this beautiful tiered dish! And it was only $1.00! Well, those were my camping finds. Now, lets see what some of you shared last week. Over at A Few Pennies, she shared some fantastic finds! Love these vintage chairs. Sugar & Spice in the land of Balls & Sticks found a great curbside freebie! Confessions of a Plate Addict shared a tutorial on how to make these gorgeous tea towels at a thrifty price! Thank you ladies! If you haven’t already grabbed the I was featured button, please do so! 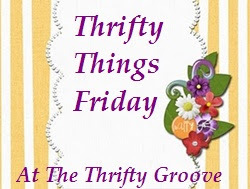 Now, let’s see what thriftiness you have to share with us this week! I love those glasses especially the green ones! Thank you for hosting. Hope you have a great weekend! That green glass is gorgeous! Thanks for the party. I also love the green glass's sweet. I need to go out looking mybe some thrift stores!!! I miss you visiting my Tablescapes sweet lady.Im one of your old folower. First time linking up today! Love those green stemmed glasses! So pretty. And those tea towels are adorable. Great finds! Love the green stemmed glasses. People understand that life happens. We don't want people to get burned out by putting unrealistic expectations on them for how often they must blog or return comment. Just do what you can and want to do. And leave it at that. I loved the tiered tray! Great find! Hope you had a relaxing vacation! Nice finds while on vacation! The glasses with green stems are gorgeous. And that tiered serving tray - Love that!! You find the best stuff at the best prices! The price of hosting a popular party - you just do not have enough hours in the day to comment on every ones posts or return every comment. We understand and appreciate your being a gracious hostess. Besides - the idea of vacation is to relax and enjoy activities outside of your typical routine. Glad you had a good time, enjoyed fun family times, and were able to also enjoy some thrifty fun finds. I know what you mean about the commenting. That's why I don't post often in the summer, as I know I won't be able to return the visit, and I really think I should. Love those glasses, and the tray is beautiful! The tiered tray is gorgeous....well, all your finds are great!!! Thanks for hosting the party!!! The tiered server is just lovely, I can just imagine it holding yummy goodies for tea. Thanks for hosting! Thanks for hostessing another great party. I've got your button!